Siberian group Sistema Bezopasnosti ("Safety System)" has established itself as one of the brightest representatives of Russia in the directions of esoteric dark folk, neoclassical and dark ambient. "Swan Song" was recorded entirely in a home studio and represents apocalyptic folk music in vein of Current 93, but with a more "fairytale" touch. Stood amongst the romantic aesthetics of decadence, the album demonstrates a sense of taste, style and subtle irony, despite the gloomy apocalyptic tone. 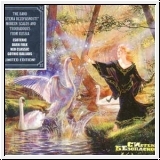 Emotional ecstatic vocals and original poetry, classical mystical prose and heroic ballads weave a luxurious veil of many sounds, voices and instruments. A great opportunity to plunge into the magical world of the other. Diesen Artikel haben wir am Mittwoch, 20. Mai 2015 in unseren Katalog aufgenommen.